Chinese scientists have developed a way to monitor carbon dioxide from space, air and ground in the Beijing-Tianjin-Hebei region, one of most polluted regions in the world, to help the government identify emissions peak and fulfill its Paris Agreement commitment. The scheme would help scientists obtain comprehensive concentration data in the region, and establish a real-time carbon dioxide concentration monitoring system to better identify emissions sources and come up with reduction and anti-smog measures, scientists said. 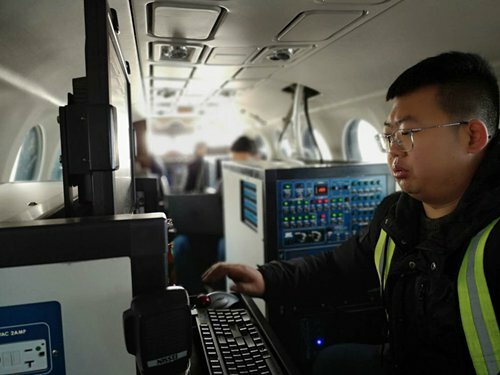 For air monitoring, meteorologists used a plane equipped with a high precision carbon dioxide real-time monitoring system to fly at 11 different altitudes from 600 to 5,100 meters over Shijiazhuang, Hebei Province to measure carbon dioxide concentrations at different levels, Wu Guomin, an engineer at the Hebei Province Meteorological Bureau, told the Global Times on Tuesday. Wu, who was on the plane, recorded the data, including the location, the carbon dioxide concentration and speed of the plane. Due to massive emissions of pollutants from factories and vehicles, the Beijing-Tianjin-Hebei region topped the world in carbon emissions intensity, and studies of carbon dioxide and other pollutants in the air could better help China tackle smog, Zeng Ning, a professor at the Chinese Academy of Sciences' Institute of Atmospheric Physics. The monitor and studies would help China form its carbon dioxide monitoring system which could help China identify the emissions peak. China aims to hit peak emissions of carbon dioxide by 2030, Zeng said. The system would also provide the world a guide as global science communities try to develop integrated greenhouse gas monitoring systems to aid the climate mitigation targets set by global agreements, such as the Paris Agreement, Zeng said. China's carbon dioxide monitoring satellite, TanSat, launched in 2016, was set to target mode to focus on the Beijing-Tianjin-Hebei region this week to help scientists gather more data, Yao Bo, chief scientist of greenhouse gas measurements at the Meteorological Observation Center of the China Meteorological Administration, told the Global Times on Tuesday. On the ground, scientists relied on vehicles for mobile monitoring and six ground-based tower stations in the region, Yao said.